Fiology thanks Brad Barrett of Travel Miles 101 and ChooseFI for shaping this lesson. Opportunity cost is defined as the loss of potential gain from other alternatives when one alternative is chosen. In its essence it means that if you spend your time and/or resources on one event, you can no longer spend it on another. Today, after the longest stock market bull run in history, an investor may decide to shift her investments out of stocks to cash in order to reduce risk. In this example, the opportunity cost is potential investment returns of staying invested in the stock market. Nearly every decision we make include trade-offs. You have heard that the cost of something is what we are willing to pay, or give up, to get it. And while money is a focus on our FI journey, it isn’t the only thing we should consider when faced with a decision. Fiology Lesson 11 encouraged us to Let Our Values Guide Our Decisions. The same thing applies here. Being aware of the concept of opportunity costs, we are able to analyze and understand the impact our choices have on our bottom line and our quality of life, which should be guided by our values system. 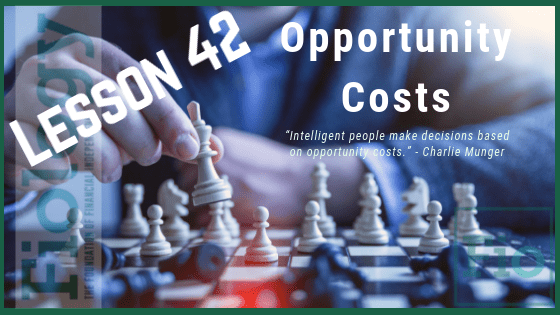 The purpose of this lesson is to introduce and discuss the concept of opportunity costs so that our understanding of our decisions can be more complete, leading to more intentional future decisions. Take Action: Think about the last purchase you made above $1,000. List some of the opportunity costs of that purchase. Were those in line with your values and goals? Did it contribute to your happiness? I love the idea of this site to give helpful FIRE lessons arranged in a nice easy to read layout. Pretty fun to go through each one. Looking forward to future lessons! Thanks, I thought so too and that is why it exists. I couldn’t find anything like it so it was created to help give a framework to think about and efficiently navigate the concepts. Thanks for your comment!